Get real-life practice in insurance billing and coding! 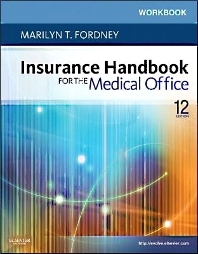 Corresponding to the chapters in Fordney's Insurance Handbook for the Medical Office, 12th Edition, this workbook provides realistic, hands-on exercises that help you apply concepts and develop important critical-thinking skills. Study tools include chapter overviews, key terms, chapter review exercises, and workbook assignments. A companion Evolve website includes patient simulations for additional practice in real-world billing. Online Student Software Challenge contains 10 patient cases that you can use to complete the CMS-1500 claim form. Performance objectives make learning easier by highlighting what you need to accomplish in each chapter. Key Terms and Key Abbreviations provide a quick reference to the health insurance terminology you need to know. Study outline focuses your review by listing key points for each chapter in the textbook. Self-study review exercises include matching, true/false, multiple-choice, and fill-in-the-blank questions to help you practice and remember important material. Critical-thinking assignments help you apply theory to practice, using short, real-world scenarios to prepare you for working in today's medical office. Evolve resources include the Student Software Challenge, self-assessment quizzes, and web links for further research and study.